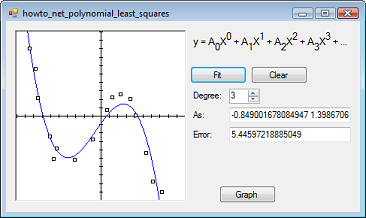 This example shows how to find a polynomial least squares fit for a set of points in Visual Basic .NET. The example Find a linear least squares fit for a set of points in Visual Basic .NET explains how to find a line that best fits a set of data points. If you haven't read that example yet, do so now because this example follows the same basic strategy. The goal is to minimize the sum of the squares of the vertical distances between the curve and the points. Keep in mind that you know all of the points so for given coefficients you can easily loop through all of the points and calculate the error. If you store the coefficients in a List(Of Double), then the following function calculates the value of the function F(x) at the point x. 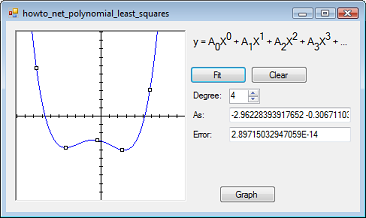 The following function uses the function F to calculate the total error squared between the data points and the polynomial curve.
' Return the error squared. Take the partial derivatives of the error function with respect to the variables, in this case A0, A1, ... Ad. Set the partial derivatives equal to 0 to get N + 1 equations and N + 1 unknowns A0, A1, ... Ad. Solve the equations for A0, A1, ... Ad. This is a relatively simple equation with d + 1 unknowns A0, A1, ..., Ad. When you take the partial derivatives for the other values of k as k varies from 0 to d, you get d + 1 equations with d + 1 unknowns, and you can solve for the unknowns. Linear least squares is a specific case where d = 1 and it's easy to solve the equations. For the more general case, you need to use a more general method such as Gaussian elimination. The example Solve a system of equations with Gaussian elimination in VB .NET explains how Gaussian elimination works, but for now assume you have code that can perform Gaussian elimination to solve for the As. The following code shows how the example program finds polynomial least squares coefficients.
' Find the least squares linear fit.
' (degree + 2) terms each (including the constant term).
' Calculate the coefficients for the equations.
' Calculate the coefficients for the jth equation.
' Calculate the constant term for this equation.
' Calculate the other coefficients.
' 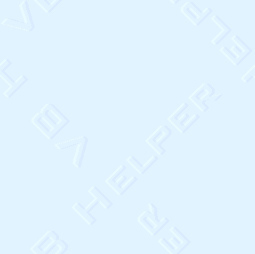 Calculate the dth coefficient.
' Return the result converted into a List(Of Double). The code simply builds an array holding the coefficients (the Ss in the previous equation) and then calls the GaussianElimination method to find the As. It converts the result from an array into a List(Of Double) for convenience and returns it. Give the program a try. It's pretty cool! Tip: Use the smallest degree that makes sense for your problem. If you use a very high degree, the curve will fit the points very closely but it will probably emphasize structure that isn't really there. For example, the picture on the right fits a degree 4 polynomial to points that really should be fit with a degree 2 polynomial.